These 16 inch stripping pads are made specifically for use with our 32 walk behind, and rider auto scrubbers. When used with concentrated stripping solution, these pads will strip all finish off of a commercially tiled floor. 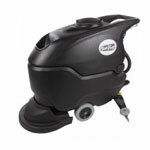 Use your auto scrubber to double scrub your floors for removal of heavily laid finish on your floors.